The capitol of Georgia is Atlanta. This fast growing city with a 45-year reputation, is considered the black mecca of the south. Georgia, now the top filming location in the world for film and television according to FilmL.A, generating $9.5 billion in economic impact in fiscal 2017 for the state. With 320 film and television productions shot in the state last year, including several Marvel movies, Netflix’s “Stranger Things” and AMC’s “The Walking Dead,” Georgia is booming. I have always heard the saying ‘knowledge is power.’ But this truth has come to be a powerful slogan in my life as I unraveled the confederate heritage mistruths that racists and white supremacists continue to spread in Georgia and throughout this country. Below is the history of Georgia’s state flags. Georgia state senator Herman H. Perry introduced the 1879 flag and it “was adopted to memorialize Confederate soldiers during the American Civil War. Perry was a former colonel in the Confederate army during the war, and based the design of the flag on the first national flag of the Confederacy, also known as the “Stars and Bars”. Over the following decades, the flag was changed by adding, and then changing the “charge” on the flag. In 1906, the word “Georgia” was added to the flag along with other modifications that varied depending on who made the flag. The Georgia state seal began appearing in place of the coat of arms. The Georgia state flag that was used from 1956 to 2001 featured a prominent Confederate battle flag and was designed by Southern Democrat John Sammons Bell, a World War II veteran and an attorney who was an outspoken supporter of segregation. The 1956 flag was adopted in an era when the Georgia General Assembly “was entirely devoted to passing legislation that would preserve segregation and white supremacy”, according to a 2000 research report by the Georgia senate. There are few, if any, written records of what was said on the Georgia House and Senate floors when the 1956 flag bill was being introduced and passed by the Georgia legislature, nor does Georgia law provide for a statement of legislative intent when a bill is introduced, although former U.S. Congressman James Mackay, one of the 32 House members who opposed the change, later stated, “There was only one reason for putting the flag on there: like the gun rack in the back of a pickup truck, it telegraphs a message.” Additionally, the 2000 report concluded that the “1956 General Assembly changed the state flag” during “an atmosphere of preserving segregation and resentment” to the U.S. government’s rulings on integration. Miller’s successor as governor, Roy Barnes, responded to the increasing calls for a new state flag, and in 2001 hurried a replacement through the Georgia General Assembly. His new flag, designed by architect Cecil Alexander, sought a compromise, by featuring small versions of some (but not all) of Georgia’s former flags, including the controversial 1956 flag, under the words “Georgia’s History.” Those flags are a thirteen-star U.S. flag of the “Betsy Ross” design; the first Georgia flag (before 1879); the 1920–1956 Georgia flag; the previous state flag (1956–2001); and the current fifty-star U.S. flag. In a 2001 survey on state and provincial flags in North America conducted by the North American Vexillological Association, the redesigned Georgia flag was ranked the worst by a wide margin. The group stated that the flag “violates all the principles of good flag design.” After the 1956 state flag was replaced in 2001, the Georgia city of Trenton adopted a modified version as its official city flag, to protest its discontinuation. In 2002, Sonny Perdue was elected Governor of Georgia, partially on a platform of allowing Georgians to choose their own flag in a state referendum. He authorized the Georgia legislature to draft a new flag in 2003. 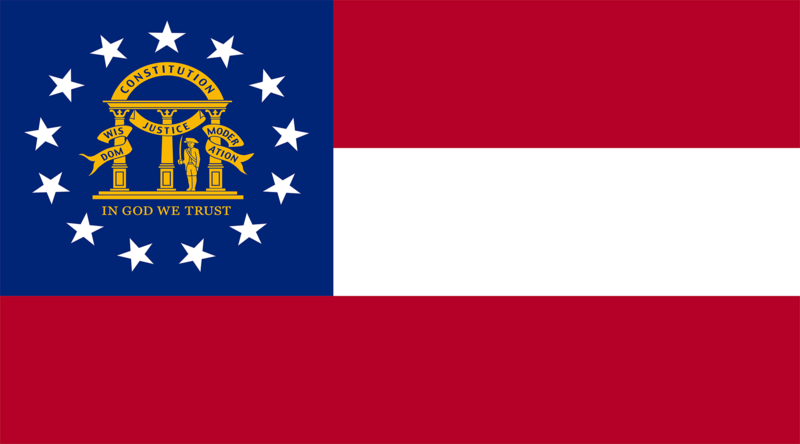 The Georgia General Assembly’s proposed flag combined elements of Georgia’s previous flags, creating a composition that was inspired by the Confederate First National flag, the Stars and Bars, rather than the Confederate Battle Flag. Perdue signed the legislation into law on May 8, 2003. The 2003 flag legislation also authorized a public referendum on which of the two most recent flags (the 2001 and 2003 versions) would be adopted as the flag of the state. The referendum took place during the state’s March 2, 2004 presidential primary election. If the 2003 flag was rejected, the pre-2001 design would have been put to a vote. The 2003 design won 73.1% of the vote in the referendum. The current Georgia state flag is the first national flag of the Confederacy with the state’s seal in the top left corner. We are now ‘woke’ to the intricate workings of racism and white supremacy, as well as how cultural conditioning has allowed the black community to overlook the disgusting Confederacy symbolism and meaning of the flag. But overlook no more. Georgia’s Confederacy pride is flying with pride today, but we will not overlook what the flag represents — it must be retired immediately. BLACKGWINNETT Magazine is launching a campaign to change the Georgia state flag. How can Georgia be the number one location in the world for film and television productions flying the first national flag of the Confederacy? Azarian, Alexander; Fesshazion, Eden (August 2000). “The State Flag of Georgia: The 1956 Change In Its Historical Context”(PDF). Senate Research Office. 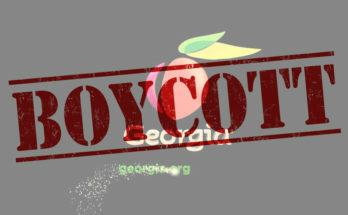 State of Georgia: State of Georgia. Archived from the original (PDF) on December 4, 2014. Retrieved December 4, 2014. 2001 State/Provincial Flag Survey Press release from the North American Vexillological Association. Accessed online December 16, 2006. Rick Wyatt (July 4, 2009). “Trenton, Georgia (U.S.)”. Flags of the World. Retrieved July 6, 2010. “Flags That Have Flown Over Georgia: The History of the Georgia State Flag – Georgia State Flag, Current”. Secretary of State of Georgia. 2003. Archived from the original on September 16, 2008. Retrieved September 17, 2013. “New state flag endorsed by Georgia governor, lawmakers”. USA Today. Associated Press. April 4, 2003. Retrieved October 7, 2007. “Official Results of the March 2, 2004 Presidential Preference Primary and Statewide Special Referendum”. State of Georgia. July 7, 2004. Retrieved October 7, 2007.